Over the last couple of years, scientific studies have cast doubt on the simple and elegant idea of calorie-counting. No one’s disputing the physics of it: A calorie is nothing but a measurement of the energy stored in food, and indeed, if you eat too few calories, you will start burning up your own tissue. What’s being called into question is the conventional wisdom that to lose weight, people should readjust their ratio of calories eaten to calories burned. For example, a spate of recent studies have shown that people who start exercise programs fail to lose much weight. One study found that people who did lose large amounts of weight later gained 70 percent of it back, even though they continued to consume fewer calories. The problem is that we’re not in charge of running our bodies. Even with modern food-labeling and calorie-counting apps, forces beyond our conscious control keep fiddling with how many calories we burn each day and how hungry we feel. The longstanding illusion of control has implications for America’s health-care policy, since obesity is tied to the major killers — heart disease; diabetes; and, to a lesser extent, cancer and Alzheimer’s disease. Many Americans wrongly think that the two-thirds of their fellow citizens who are overweight or obese are to blame for eating too many calories. But a recent study out of Stanford University suggests that the solution to obesity isn’t what people have been led to believe. Researchers divided 609 overweight volunteers into two groups. They were instructed to eat as much food as they wanted, either on a low-carbohydrate/high-fat diet or a low-fat/high-carbohydrate diet. They were told not to count calories or control portions, but simply to avoid soda and other sugary drinks, white bread, and industrial junk foods (even if, as is so often the case, it was advertised as “low-fat” or “low-carb”). The purpose of the study was to compare healthy low-fat/high-carb diets to healthy high-fat/low-carb diets. The researchers also analyzed participants’ genetic information to see if certain genetic variants influenced how people responded to the diets. The press interpreted the study in different ways — one outlet used it in a large piece questioning whether carbs are making “us” fat; another suggested that both low-carb and low-fat diets work. One story concluded, “As near as I can tell, the bottom line is that if you want to lose weight, eat less.” This seems about as useful as telling poor people they should make more money. The admonition to eat less contradicts what seems heretical about the study — that people on the low-carb arm could eat all the fat they wanted, and the low-fat arm could eat unlimited carbs, as long as they ate none of the aforementioned “garbage.” It seems likely they could have also lost weight while eating unlimited amounts of healthy food of all kinds, thus countering the myth that we’re all wired to overeat and we must suffer and starve to be healthy. I had an epiphany on this matter a few months ago while discussing an earlier column with science writer Gary Taubes, author of several books on diet. He told me he never counts calories, yet his weight always stays the same. Taubes is on a low-carbohydrate, high-fat diet, but I realized that I experience uncanny weight stability even though I’m not on any special diet and tend to eat very different things in different amounts from day to day. It’s like I have a magical fatistat. Sure, that’s anecdotal evidence — but the Stanford study suggests Taubes and I are not alone. Overall, subjects lost weight while eating as many calories as they wanted. 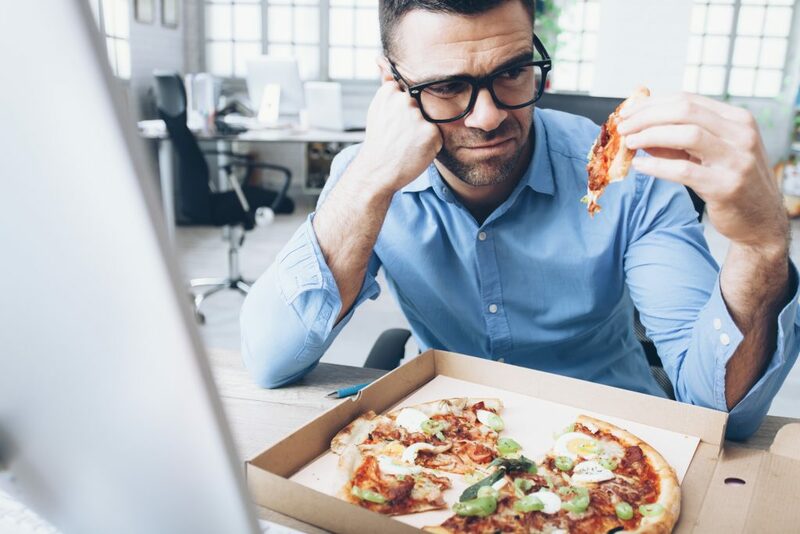 University of California San Francisco endocrinologist Robert Lustig agrees with Gardner that processed food is a problem — and that the food industry has played into the myth that people can eat a ton of junk as long as they correctly tally up the calories. Calorie-counting fails, in his view, because eating isn’t like putting gasoline in your car — where the amount of fuel is all that matters. He described to me how different food components set off complex processes in the liver and endocrine system — a whole ballet of hormones and receptors. And trillions of symbiotic bacteria participate in this dance, digesting some of our food and carrying out a running chemical conversation with the immune system. Carbohydrates in non-processed foods generally come along with fiber, he pointed out, and this is what those symbiotic bacteria need to function. As a next step, scientists might want to find a more precise definition of “processed convenience food [garbage],” which is not currently a scientific term. Perhaps it could lead to one that would help people more than calorie labels ever did.